Mobile video consumption continues to rise, but growth stabilized in Q1 2018; total video plays increased during the quarter just 1.8% from the prior year, per Ooyala’s newly released Q1 2018 Global Video Index Report. The increase was one of the smallest in 14 quarters, and also marked the first quarter-over-quarter decline in mobile’s share of plays at nearly 4.6%. Nevertheless, consumption on mobile devices of long-form video – defined as more than 20 minutes in length – continues to thrive, the study finds. On smartphones, for example, 20-to-40-minute-long videos were viewed to completion 57% of the time, while videos exceeding 40 minutes (ultra-long form) were viewed to completion more than 45% of the time, the Ooyala study found. 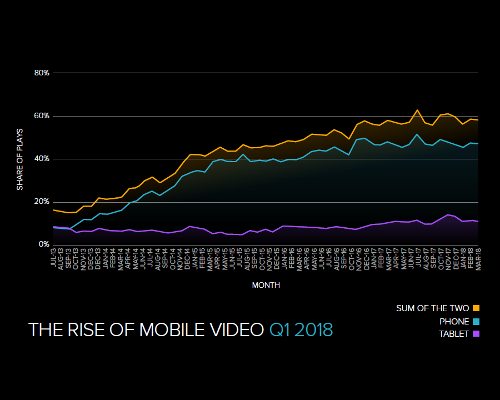 But in North America, mobile video plays were still up 9% from a year ago and 18% over the past two years, accounting for 56.6% of all video plays in Q1 2018. The full Ooyala Q1 2018 Global Video Index Report can be found here.